There are SO many reasons to wear a personal identification of some kind and recent news stories have pointed out the tragedies of not doing so. Many folks are seeking products without the blaring announcement of a medical condition. American Nameplate offers the following items that can be used for identification of persons with or without medical needs. Check out these great looking tags! 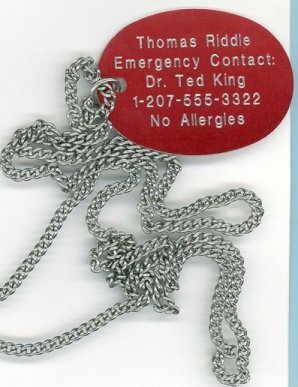 We also have oval tags that can be worn either attached to a shoe lace or with a neck chain. Right now, American Nameplate is developing a broad line of these products. Inexpensive and with plenty of room for your personalization, they can fill SO many needs. If you have something in mind that we don't show here, give us a call or drop us an e-mail as we may have that item already! These items make excellent and thoughtful gifts for students, travelers, those with problems remembering and many more. Don't forget yourself when you order. 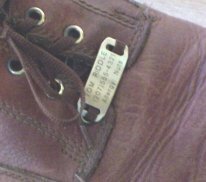 Remember, you can have ANYTHING engraved on these tags so whether you're involved in Campfire, Boy Scouts, Brownies, a varsity pep club or ANY group where group identity helps form bonds of friendship and cooperation, this is a GREAT idea for you! SO very inexpensive but so valuable: have your school name and team on one side with the person's name on the back for identification if needed. Your bowling team, cheerleaders, Rainbow assembly, or ANY group will find these fun! Quick delivery too! When it comes to Personal Identification and Identity needs, turn to American Nameplate!